WASHINGTON — President Donald Trump has declared, “I am my own strategist.” That would seem to bode poorly for his actual strategist, Steve Bannon. The unusual public, lukewarm support from the boss has Bannon’s friends and advisers worried he will soon be out of a job. But shedding Bannon would be no simple staff shake-up. More than any other member of Trump’s orbit, the former media executive and radio host, known as a bare-knuckle political fighter, has a following all his own. He is viewed by many in the conservative core as the ideological backbone in a White House run by a president who boasts of his flexibility. “I think it’s important to recognize the value of the base. It’s important to recognize the base sees their advocate in Steve Bannon,” said Michael Caputo, a former Trump campaign adviser who has known the president for decades. Bannon is not the only Trump official to find himself in the hot seat in a White House divided. Press Secretary Sean Spicer has also come under fire for comments he made about the Holocaust on Tuesday. Spicer has apologized repeatedly, including on Wednesday, and the White House hopes that controversy will pass. As for Bannon, before joining the campaign last summer as its chief executive officer, he was informally advising Trump. And as leader of the conservative Breitbart News he spent the better part of a year connecting Trump with the populist, nationalist voters who would propel him to victory over 16 Republican opponents and Democrat Hillary Clinton. In more than half a dozen interviews during the campaign with Bannon on Breitbart’s radio show, Trump laid out his vision for leading the country, with Bannon sometimes playing the role of coach. Bannon, more than any other White House aide, speaks the language of Trump’s populist base. He spoke in February of “our sovereignty” as a country and about the new administration’s aim for “deconstruction of the administrative state.” He also helped write many of Trump’s hardest-line speeches. 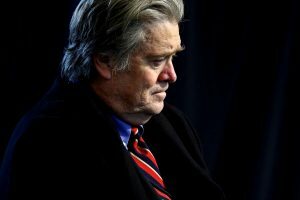 “It would be a terrible signal if Trump were to either force Bannon out or let him go because he is the face of the national populism that inspired a lot of voter to vote for Trump,” said Ned Ryun, founder of the conservative group American Majority and a longtime friend of Bannon’s. That view cuts to the core of why Bannon might be on the outs at the White House. He’s feuded with Trump’s son-in-law-turned-senior-adviser, Jared Kushner, and with economics chief Gary Cohn. Both are New Yorkers who have voted for Democrats. Cohn, the former No. 2 at Goldman Sachs, and fellow Goldman executive Dina Powell, one of Trump’s top national security advisers, have been gaining favor with the president. Last week, Trump removed Bannon from the National Security Council, while Powell appears to be ascendant. The president’s irritation with Bannon could have roots in the adviser’s high profile in the early days of the administration. Democrats waged a campaign to brand him as “President Bannon.” He appeared on Time magazine’s cover and was portrayed on “Saturday Night Live” as the Grim Reaper pulling the president’s strings. Recently, the president has undercut Bannon in front of other senior staffers, including questioning the need for his presence in certain White House meetings. Bannon is seen as increasingly isolated within the White House, particularly after the health care debacle. His hard-line sales pitch to the Freedom Caucus lawmakers — he told the Republicans that the White House-based legislation was not up for debate — was panned inside the West Wing as a major misstep that cost Trump votes. The original travel ban, a Bannon effort, is mired in the courts, and Trump appears to be backing away from some of the economic policies that Bannon championed. And Bannon’s creation of an in-house think tank known as the Strategic Initiatives group has been marginalized. Some staff members initially hired for that project are now part of the Kushner-led Office of American Innovation. It’s Bannon’s rift with Kushner that seems to have troubled the president the most. The 36-year-old and 63-year-old have clashed repeatedly in recent weeks. Trump has stressed loyalty in his business and political careers and has shown a reluctance to dismiss top aides, even under public pressure. But he also has drawn a line in the past when it comes to his kids. It’s a lesson learned by Trump’s first campaign manager, Corey Lewandowski, who was pushed out of his role after clashing with the president’s children about the direction of the campaign. But Bannon’s supporters say Kushner’s importance doesn’t erase Bannon’s. Caputo said that Bannon must “fix things” in White House relationships but dismissed as “hype” the belief that he is about to lose his job. In the end, whoever is advising in the White House, “this will be a Trump presidency,” says former House Speaker Newt Gingrich, an informal Trump adviser.